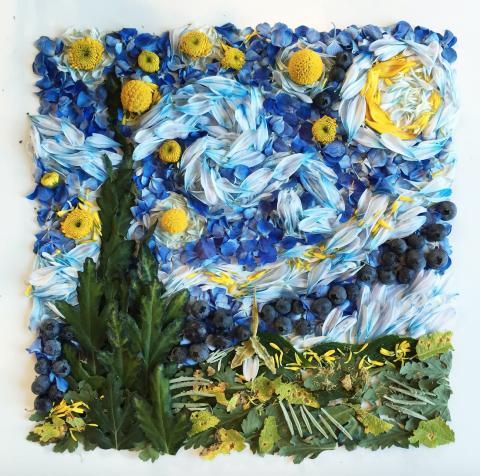 Flora Forager, “Van Gogh’s ‘The Starry Night,'” 2016. Billy buttons, blueberry, chrysanthemum, hydrangea, lavender, sunflower. Used with permission from Bridget Beth Collins (Flora Forager). 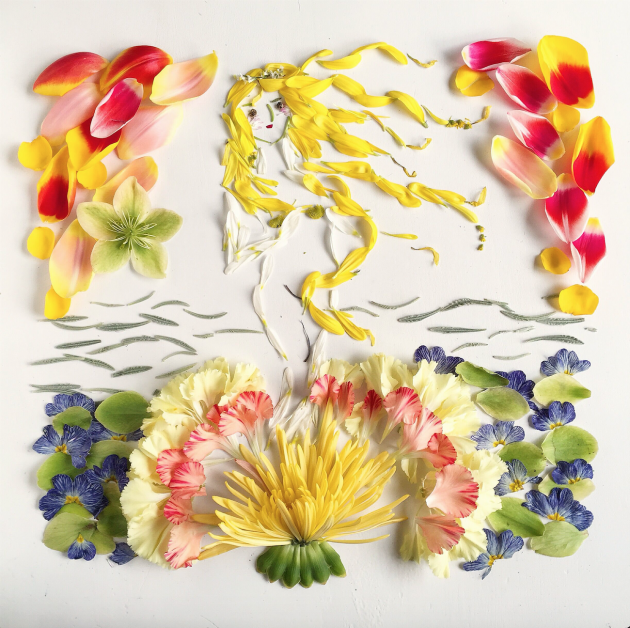 Last week I had the opportunity to interview Bridget Beth Collins, a Seattle-based artist who creates gorgeous collages out of flowers, leaves, and other botanical items like pinecones, mushrooms, fruit and seeds. 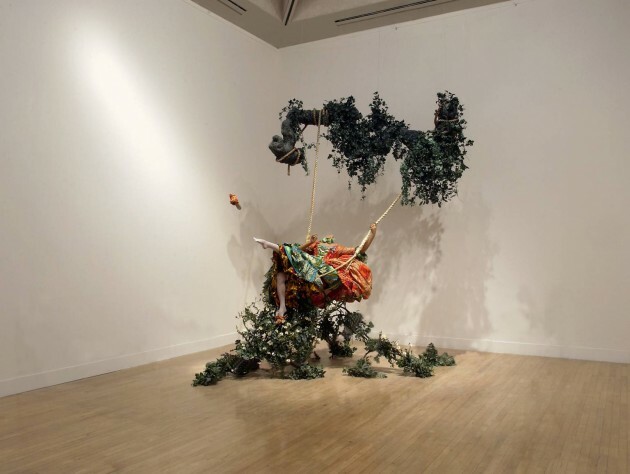 Collins works under the pseudonym of “Flora Forager” since her collages often consist of botanical elements found in her garden or the green areas surrounding her Seattle-based home. Just last month, her book The Art of Flora Forager was released, and it is such a delight to see and read! I really am thrilled about this book. Similarly, it was a real pleasure for me to meet Bridget in person, since I automatically feel a true affinity with people who love flowers, juvenile fantasy fiction, and (as I discovered in the course of our conversation) old murder mystery television series. Ever since I became familiar with Flora Forager’s work on Instagram earlier this year, I’ve been charmed with her creative subject matter, the novelty of her compositions, and also her unusual choice of medium. 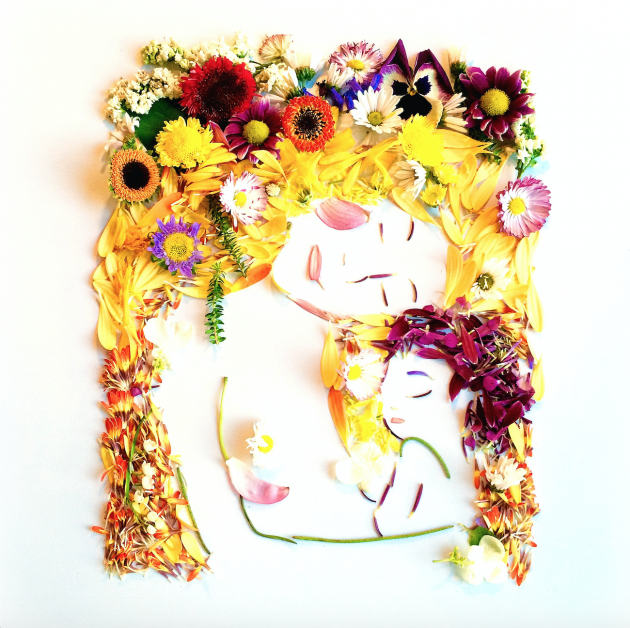 Flora Forager’s whimsical collages depict things like animals, insects, woodland fantasy scenes, mandalas, star constellations, portraits of iconic women, and even copies of famous masterpieces. 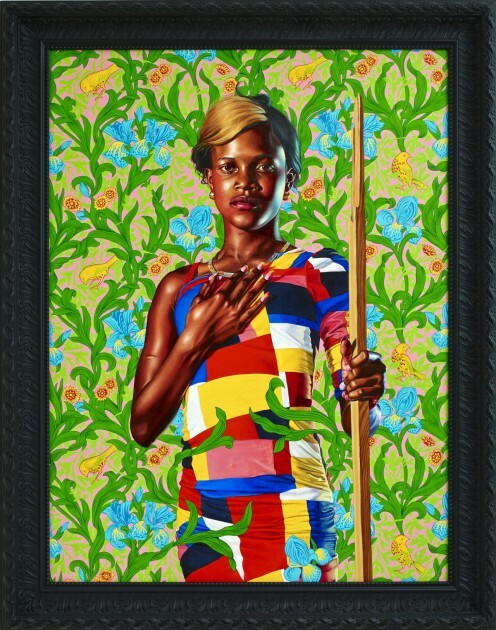 In concept, her collages might remind one of colonial feather paintings or even Grace Kelly’s pressed flower collages. 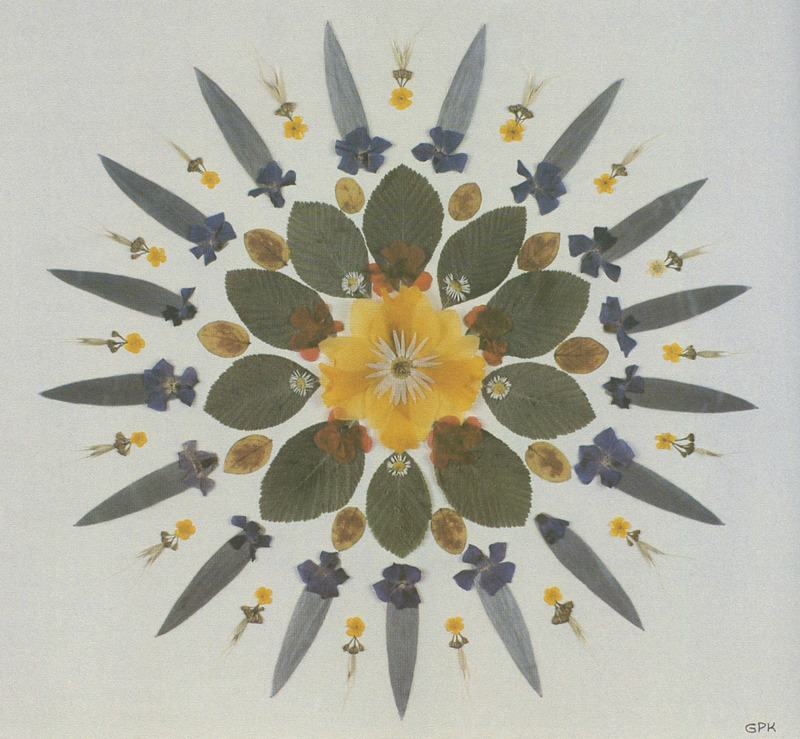 However, in the course of my conversation with Bridget, it became apparent that her work is very different from Grace Kelly’s flowers, even if sometimes their compositions are loosely similar (compare Grace Kelly’s geometric patterns with one of Flora Forager’s mandalas). Flora Forager, “Klimt’s ‘Mother and Child,'”, 2015. Aster, chrysanthemum, dahlia, lacecap hydrangea, lilac, pansy, Peruvian lily, pumpkin vine, sunflower. Used with permission from Bridget Beth Collins (Flora Forager). This interest in softly modeled three-dimensional collages is really revealing to me, because I think it helps to explain why Flora Forager’s representational collages are so delightful and impactful: the three-dimensional forms and fresh flowers create a sense of plausibility and give a lively presence to something that might not actually exist in reality. For example, a three-dimensional rendering makes a fantasy scene (such as this one or this one) seem more palpable, and therefore endearing, to an escapist viewer. Such fantastic escapes and whimsical storybook tales are just within reach! And not only are they rendered possible because the collages are three-dimensional, but they are created with found objects that are easily identifiable and readily found to the viewer. 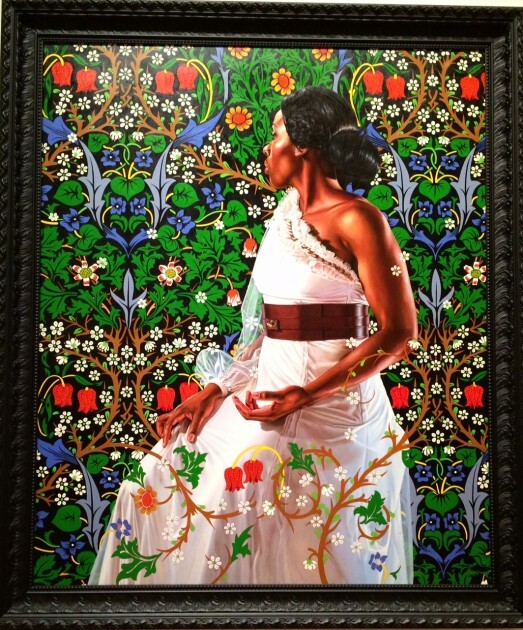 In a sense, her art suggests that fantasy is embedded within the everyday world around us. 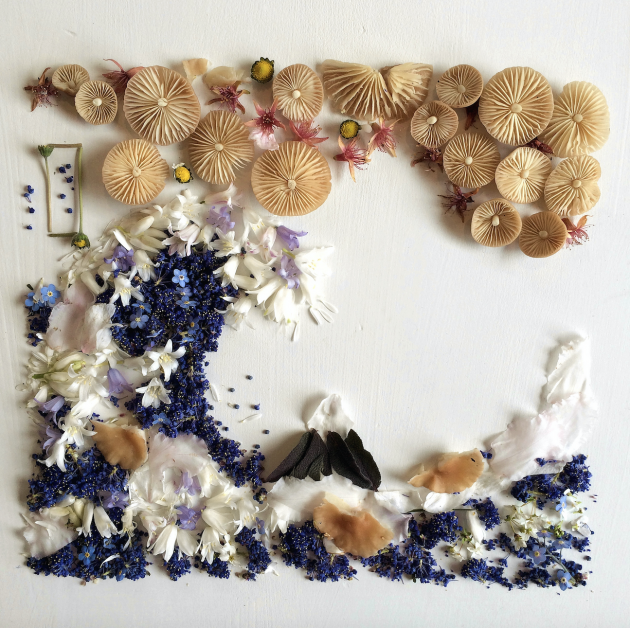 Flora Forager, “Hokusai’s ‘Under the Wave Off Kanagawa,” 2015. Bluebell, California lilac, cherry blossom, narcissus, pixie’s parasol mushroom, purple sage, rhododendron, tansy. Used with permission from Bridget Beth Collins (Flora Forager). In a related way, I think that the three-dimensional fresh flowers also affect the way that the viewer reacts to Flora Forager’s copies of famous masterpieces or portraits of iconic women (like Audrey Hepburn or Marilyn Monroe). 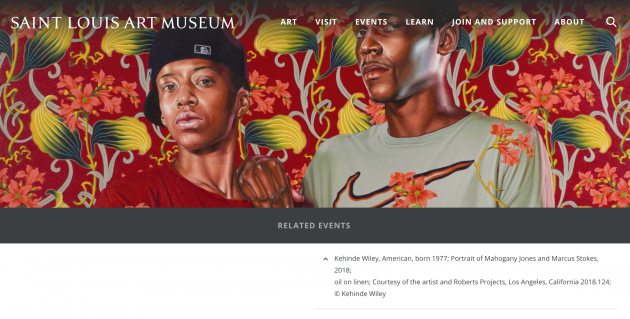 On one hand, the three-dimensional forms and botanical media give an iconic image or iconic person a new sense of presence and life: we can look at familiar objects or faces in a new way. 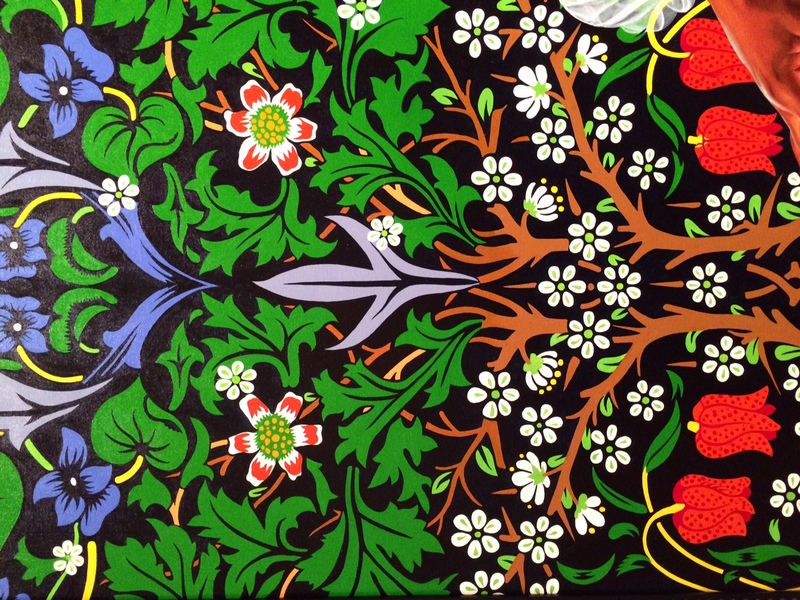 But I think that the fresh flowers also help to reinforce the iconic, timeless status of these familiar objects too. When flowers and leaves are captured as fresh and pristine in a photograph, these natural elements become immortalized in the same way that iconic images have been cemented in their well-known celebrity status. As a result, we have timeless flowers that won’t fade, similar to iconic images that don’t dissipate from cultural memory. 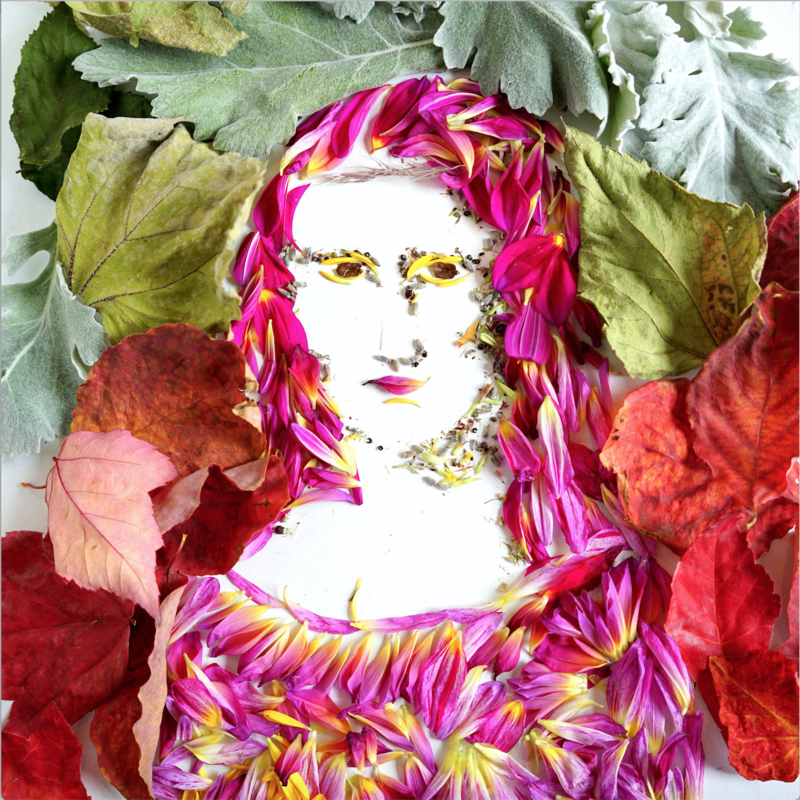 Flora Forager, “Da Vinci’s ‘Mona Lisa,” 2016. Chrysanthemum, dahlia, lamb’s ear, lavender, pinecone, red maple leaf. Used with permission from Bridget Beth Collins (Flora Forager). What Flora Forager does so well is belie the inevitable death of nature: her camera captures flowers and leaves while they are fresh and vibrant, and uses that vibrancy to her advantage to reinforce that an iconic work of art can “last forever” or that a famous celebrity is, indeed, immortal. Flora Forager, “Botticelli’s ‘The Birth of Venus,'” 2016. Carnation, chrysanthemum, daisy, goldenrod, Lenten rose, marsh rosemary, sunflower, tulip, woolly lavender. Used with permission from Bridget Beth Collins (Flora Forager). 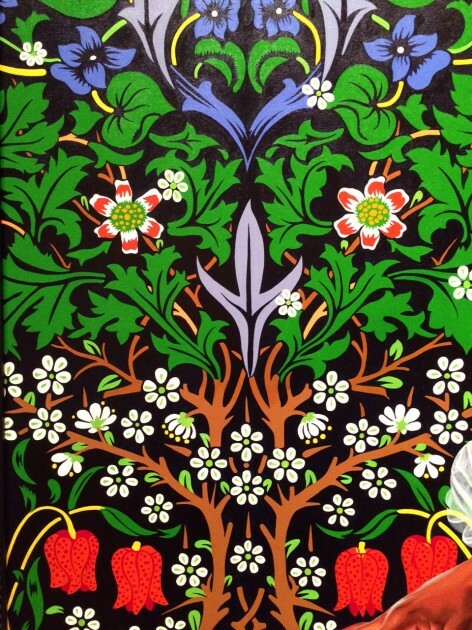 For anyone who is interested, please follow Flora Forager on Instagram and see her print shop. In addition to The Art of Flora Forager book, Bridget Beth Collins has also created Flora Forager: A Seasonal Journal Collected from Nature. She anticipates the publication of another journal titled Metamorphosis in 2018. 1 Bridget Beth Collins, interview with author. Seattle, October 5, 2017. Tonight I am feeling very sheepish. About three or four months ago, a student mentioned to me that Fragonard’s The Swing served as a point of inspiration for “Portrait of a Lady.” I found a copy of Henry James’ novel The Portrait of a Lady a few days later. Now, after reading 660+ pages and finishing the book, I was left rather confused as to what my student meant, so I went online to read some commentary. Only then did I realize that my student was referring to William Carlos Williams’ poem “Portrait of a Lady” and not the Henry James novel! I don’t regret reading lengthy book at all, but I feel less confused and won’t try to dwell on which suitors are courting Isabel Archer (or perhaps Pansy?) in this Fragonard painting anymore! Which sky? 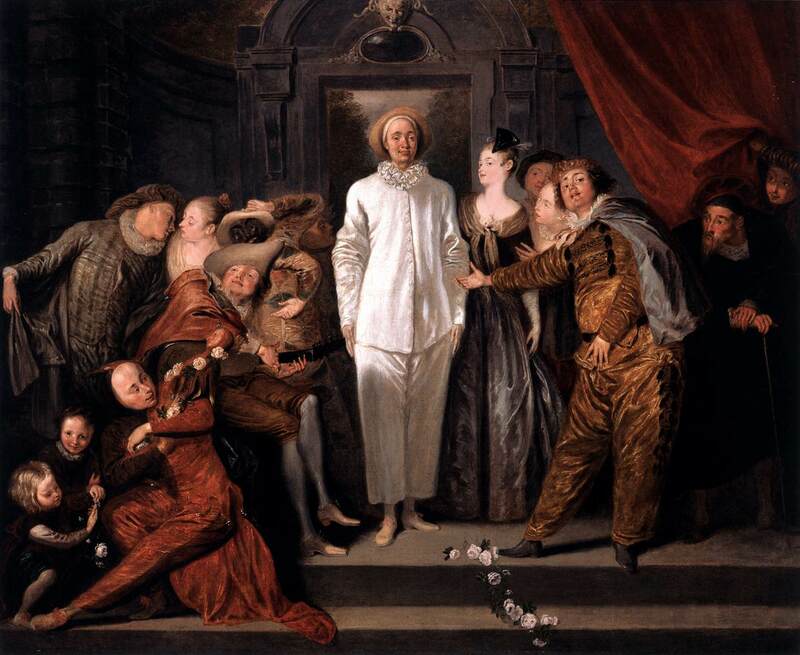 The sky where Watteau hung a lady’s slipper. sort of a man was Fragonard? 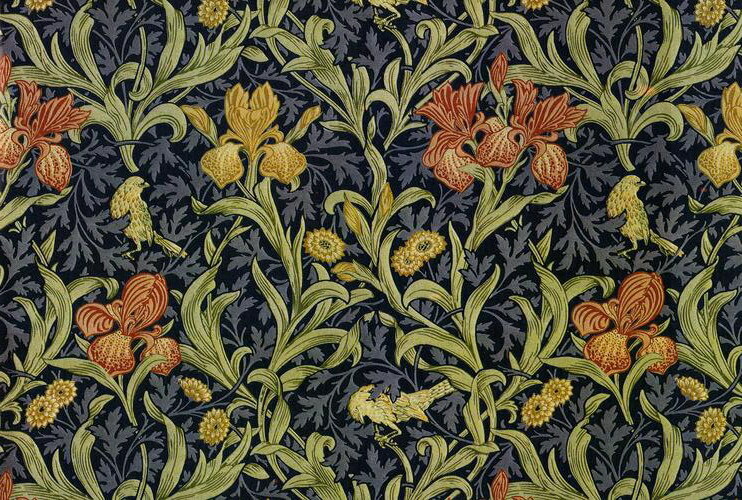 apple tree — Which shore? I said petals from an apple tree. 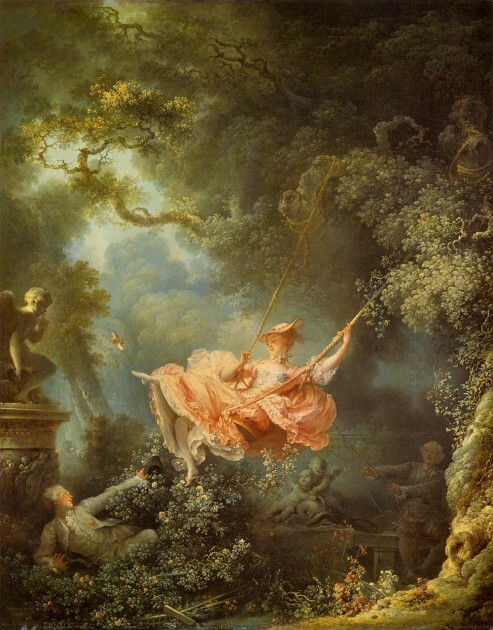 Obviously, Williams was considering the themes like love and eroticism when he made a reference to Fragonard’s The Swing, since a woman is accompanied by two suitors and she kicks off her shoe (and reveals what is underneath her dress) at the suitor who is hidden in the bushes. Fragonard is a later Rococo artist who followed in Watteau’s wake, and I think his socially-accepted painting style and traditional career don’t have the same parallels to the radical style of poetry that Williams used. However, from a compositional standpoint, I like how compositional lines meander through the painting (such as the branch which zig-zags in the upper left corner, see above); these visual lines complement the nonlinear, back-and-forth voices presented in the poem. 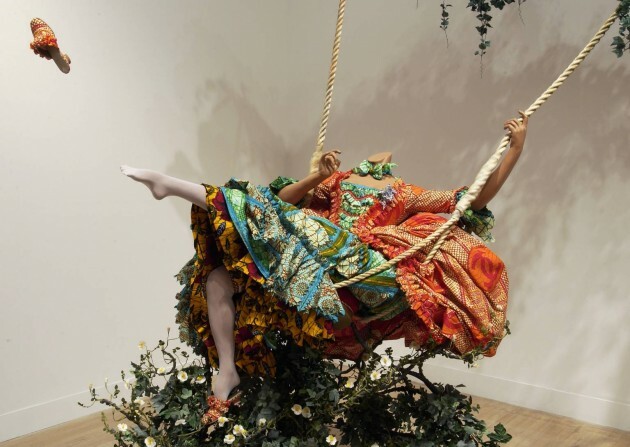 Really, I think the best work of art today that encompasses Williams’ poem is Yinka Shinobare’s installation “The Swing (after Fragonard)” from the Tate Modern. 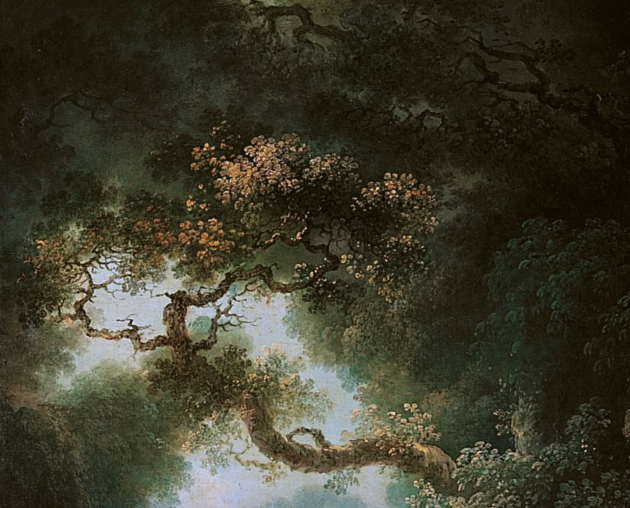 Since the Fragonard painting has become iconic, Shinobare’s composition is familiar to the viewer but also strange: the tree lacks a trunk and the principal subject lacks a head. This familiar-and-strange reaction is similar to what is conveyed through Williams’ poem, since the poem attempts to reference the traditional language of poetry (like using a metaphor about an apple tree), but the metaphors are intentionally used in an ineffective way. Since Shinobare intentionally omits aspects of Fragonard’s composition, this disjointed appearance mirrors the disjointed flow of Williams’ poem. The skin of Shinobare’s model is also dark and she wears a print that references African textiles which have a complex global history regarding colonial production and international consumption. These references to the complexities of globalization and visually acknowledging multiple voices seems to be a fitting parallel with how Williams’ poem is seen in relation to postmodernism – a movement which accepts the multiplicities of meanings and perspectives. Do you see any other parallels between Williams’ poem and either the Fragonard painting or Shinobare’s installation? 2 For more information on how Watteau’s art is associated with conflicting emotions and interpretations, see Linda Walsh, “Subjects, Society, Style: Changing Evaluations of Watteau and His Art” in The Changing Status of the Artist by Emma Barker, Nick Webb, and Kim Woods (Open University Press, 1999), 220-248. 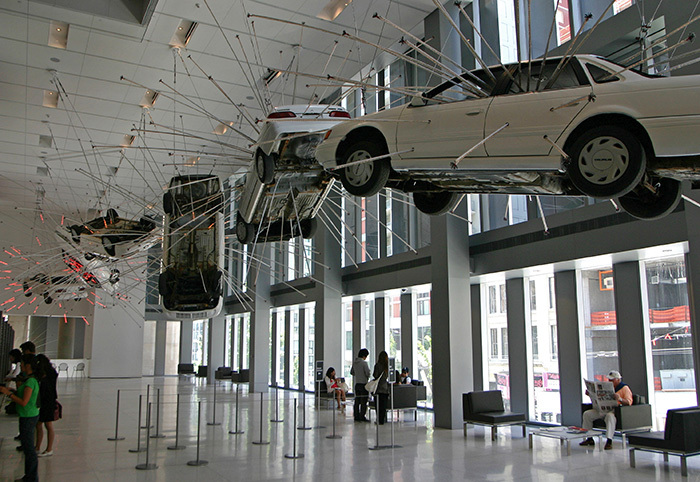 Last Friday, when I heard about the terrorist attacks in Paris, I couldn’t help but think of Cai Guo-Qiang’s Inopportune: Stage One (2004) which is on display in the Seattle Art Museum. Guo-Qiang first created this installation in 2004 for the Mass MoCA (it also was displayed at the Guggenheim in 2008). Nine Ford Taurus cars are laid out in a sequence, but the overall effect is to give the suggestion of one car that is flipping through the air (although time is standing still, so the viewer sees “freeze frame” shots of the car suspended). The first and the ninth car are placed on the ground, suggesting the beginning and end of motion, as well as the beginning and ending of an event: the exploding of a car bomb. Lights emanate from most of the cars, but the colors change as the cars flip through the air. 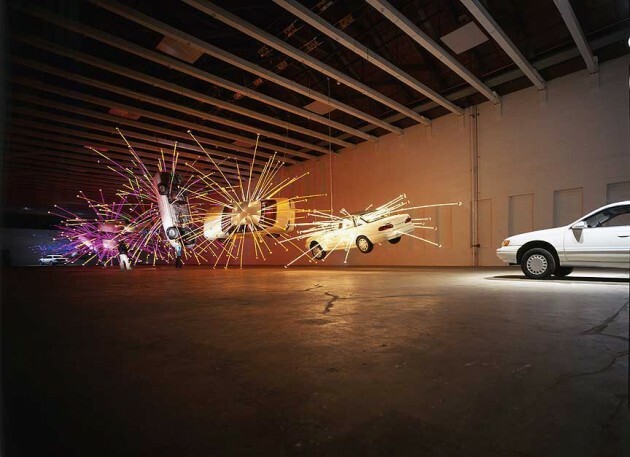 The first few cars have lights from all different colors, which have been compared to fireworks.1 (As a Chinese artist, perhaps Guo-Qiang is connecting to his heritage by alluding to Chinese fireworks.) However, the last few cars (numbers seven and eight in the sequence) emanate different colors: blue, indigo, and purple. (I actually prefer the Mass MoCA installation setup for this reason, because you can best see how the colors of the lights change.) These colors suggest that the impact and heat of the bomb are dying out, as the explosion ends. Ironically, I received notification just this afternoon that Inopportune: Stage One is going to be taken down from its permanent installation in the Brotman Forum at the Seattle Art Museum, starting soon after the beginning of the new year (January 2016). I’m torn about this decision, especially since I feel like the sentiment behind this installation, both in referencing terror and spreading beauty, is more poignant and needed than ever. This evening, though, I wondered if maybe the visuals of this installation need to be altered to fit with today’s situation. I heard a segment on the radio saying that in years to come, we may look back and say that “The War on Terrorism 1″ began in 2001 with an American initiative, and that “The War on Terrorism 2″ began right now, in 2015, with the European response. Sadly, time will tell if this is the case. But this makes me wonder if a new installation of Inopportune would be appropriate, with perhaps Renault or Citroën cars suspended in the air.